Our goal is to image chemical reactions on solid surfaces with atomic resolution. Heterogeneous catalysis, a cornerstone of modern industrial chemistry, is based on such reactions, but also many other applications use surface reactions, e.g., the new material graphene can be synthesized in this way. To image the atomic processes we develop special variants of scanning tunneling microscopy. We also use other surface methods to support this work, e.g., photoemission spectroscopy and low-energy electron microscopy. 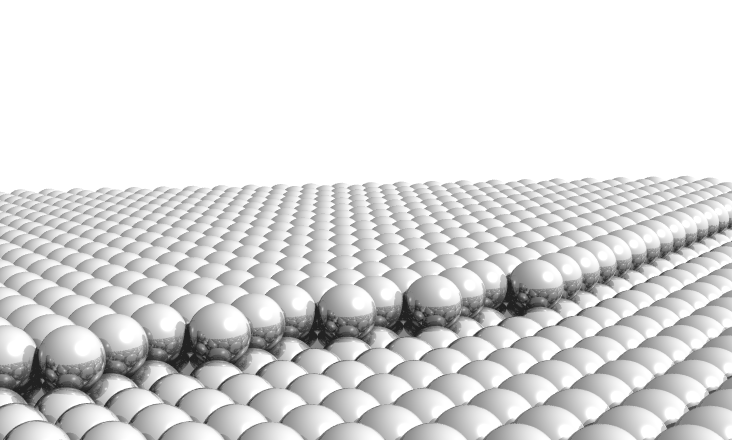 Model of a close-packed cobalt surface with a monoatomic step. The reactions of the cobalt-catalyzed Fischer-Tropsch synthesis take place on such surfaces.